Larry J. Sabato's Crystal Ball » Will Jewish Voters Abandon Obama in 2012? Will Jewish Voters Abandon Obama in 2012? President Obama’s recent speech calling on the Israeli government to accept Israel’s 1967 borders as a starting point for negotiations toward a peace agreement with the Palestinians has led to widespread speculation that large numbers of Jewish voters may turn against Obama in 2012. Republican presidential candidates and congressional leaders have criticized the president’s speech even though his support for the 1967 borders as a starting point for Israeli-Palestinian negotiations has been the official policy of the U.S. government for some time. But regardless of whether the president was breaking new ground in his speech, how realistic is the belief that a substantial number of Jewish voters would abandon their traditional loyalty to the Democratic Party out of concern over Obama’s support for the state of Israel? Based on an analysis of Jewish public opinion and voting behavior over the past two decades, the answer to this question appears to be that such a scenario is not very realistic for at least three reasons. First, similar concerns voiced by political opponents about Obama’s support for Israel had little impact on Jewish voters in 2008; second, Jewish loyalty to the Democratic Party appears to be based primarily on the liberal views of most Jewish voters on domestic policy issues, especially on social issues; and third, the influence of religious conservatives and Tea Party supporters on the Republican Party remains a major obstacle to the GOP in attracting support from Jewish voters. During the prolonged battle for the 2008 Democratic presidential nomination, exit polls indicated that most Jewish voters supported Hillary Clinton over Barack Obama. In New York and other states with large numbers of Jewish voters, the Clinton campaign sought to raise questions about the strength of Obama’s commitment to the state of Israel, questions that were echoed by some conservative Jewish leaders and pundits. After Obama had secured the Democratic nomination, there were lingering questions about his ability to win over groups that had supported Hillary Clinton in the primaries, including Jews. In the end, however, Jewish voters supported Barack Obama at about the same rate that they had supported other Democratic presidential candidates in recent elections, including Bill Clinton and John Kerry. According to the 2008 national exit poll, 78% of Jewish voters cast their ballots for Obama over his Republican opponent, John McCain. The fact that Obama had consistently supported U.S. economic and military aid to Israel while serving in the U.S. Senate and made his support for Israel abundantly clear on the campaign trail surely helped to quell lingering concerns about his candidacy among Jewish voters. What was probably even more important, however, was the continued attachment of the large majority of Jewish voters to the Democratic Party–an attachment grounded firmly on the liberal views held by these voters on a wide range of domestic policy issues. According to data from the American National Election Studies, Jewish voters are only exceeded by African Americans in their attachment to the Democratic Party. Between 1992 and 2008, 82% of Jewish voters who were interviewed in ANES surveys identified with or leaned toward the Democratic Party. In contrast, among all other white voters during these years, only 43% identified with or leaned toward the Democratic Party. What explains the continuing support of Jewish voters for the Democratic Party? After all, Democratic identification has declined fairly dramatically among some other traditionally Democratic groups such as white southerners and Catholics in recent years. The key difference appears to be that Jewish voters, unlike these other traditionally Democratic voting groups, hold solidly liberal views on a wide range of domestic policy issues, and especially on social issues such as abortion that have undermined support for the Democratic Party among some of its traditional supporters. 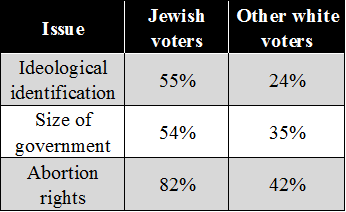 The following table compares the opinions of Jewish voters with the opinions of other white voters on a variety of questions included in American National Election Study surveys conducted between 1992 and 2008. I have combined all of the surveys during this time period in order to obtain enough Jewish voters in the sample to provide reliable results. Slightly more than 230 Jewish voters were interviewed in ANES surveys during these years. The results displayed in this table show that in addition to their overwhelming identification with the Democratic Party, Jewish voters were much more likely than other white voters to describe themselves as liberal, to prefer higher government spending and expanded services to reduced government spending and fewer services and, especially, to support abortion rights. Fully 82% of Jewish voters favored abortion rights during these years compared with only 42% of other white voters. So even if some Jewish voters were to prefer a Republican candidate’s positions on Israel to a Democratic candidate’s position, that alone might not produce a large number of votes for the Republican. Over the past 40 years, Democratic identification has declined among traditionally Democratic groups such as white southerners and Catholics as more conservative members of these groups have shifted their loyalty to the Republican Party. Among Jews, however, there has been little evidence of such a shift because those with conservative views made up a small minority of all Jewish voters. The continued liberalism of Jewish voters on domestic policy issues, and especially on social issues such as abortion, remains a major obstacle to Republican inroads. In fact, the rightward drift of the GOP in recent years has probably made any such shift of Jewish voters into the Republican camp even less likely. From the end of World War II through the 1970s, moderate-to-liberal Republicans like Jacob Javits and Nelson Rockefeller in New York, Charles Mathias in Maryland, and Edward Brooke in Massachusetts regularly won a large share of the Jewish vote. In today’s Republican Party, however, there are almost no liberals or moderates. Even moderate conservatives like Richard Lugar and Olympia Snowe now face the risk of being challenged by conservatives aligned with the Tea Party movement. And few of the likely contenders for the 2012 Republican presidential nomination could be described as moderate, let alone liberal (ex-Utah Gov. Jon Huntsman, if he runs, is one possible exception). As a result, there is almost no chance that the ultimate victor in the Republican nomination contest will be able to significantly increase the GOP share of the Jewish vote beyond the relatively small minority of conservative Jews who have been voting for Republican candidates in recent years.